Are you guys ready for the yumminess that is about to happen? Good! I’m pretty into this recipe for three reasons… One, it’s really delicious—simple as that. Two, it’s packed with protein and healthy kale. And three, if you use a packaged sauce like I did, it’s quick and easy enough to be a weekday meal. Also, let me just say that breakfast is my favorite. Not just in the morning, but at all times of the day. So yes, I’m calling this a breakfast dish by virtue of the fried egg on top, but I won’t tell if you want to eat it for lunch or dinner too. While the quinoa is cooking, steam the kale for about 3 minutes (or until tender but still fresh), and set aside. 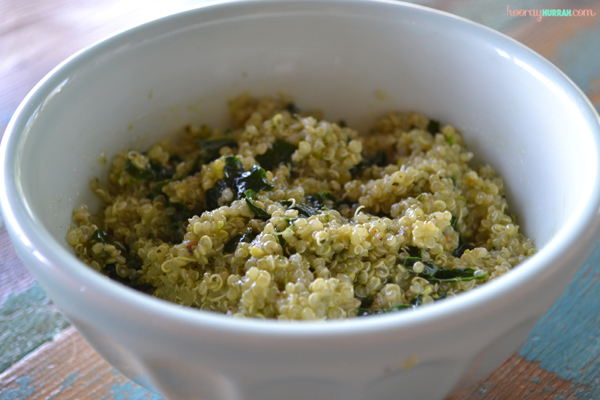 Once the quinoa and kale are both cooked, combine, and then stir in the sauce to taste. I used Savour This Sauce’s Pistachio Mint Chutney (which I’m basically obsessed with by the way), but I’d imagine that pesto would be just as yummy. 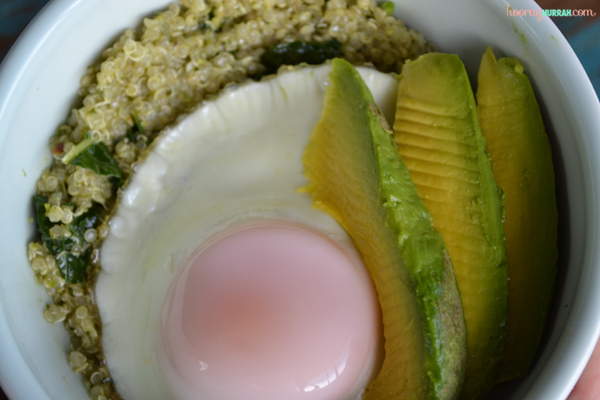 Divide quinoa mixture into 2 or 3 bowls, top each with a fried egg and a couple slices of avocado, and dig in! For a little added crunch, you could also sprinkle some sunflower seeds on top. And for a vegan version, just nix the egg and crumble a little tofu in its place. 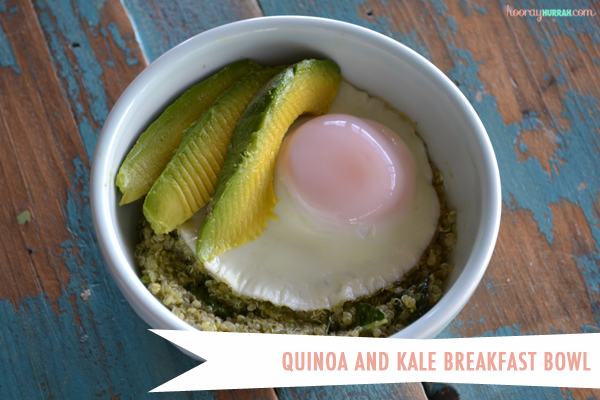 This entry was posted in Food + More, Kitchen Tidbit and tagged avocado, breakfast, egg, kale, quinoa, recipe. Bookmark the permalink.